When I initially started planning my girls trip to Las Vegas, I pictured myself carousing up and down The Boulevard because, honestly, I didn’t know much else about Las Vegas. I never had a desire to travel to big flashy cities but Vegas is now one of the places I desperately crave going back to. It far exceeded my expectations and I hold a special glittery spot for it in my heart. Based solely on my own experience, here’s my breakdown of Fremont Street VS The Strip in Las Vegas, Nevada. Fremont Street is the kind of place where you feel safe and at home despite the flashing lights, live music, and girls dancing on outdoor bars. Even though it has all the glitz, glam, and weirdness of Las Vegas, Fremont Street feels more like a little community that everyone belongs to. Initially, I was a little underwhelmed. If you’re expecting The Strip, go to The Strip. 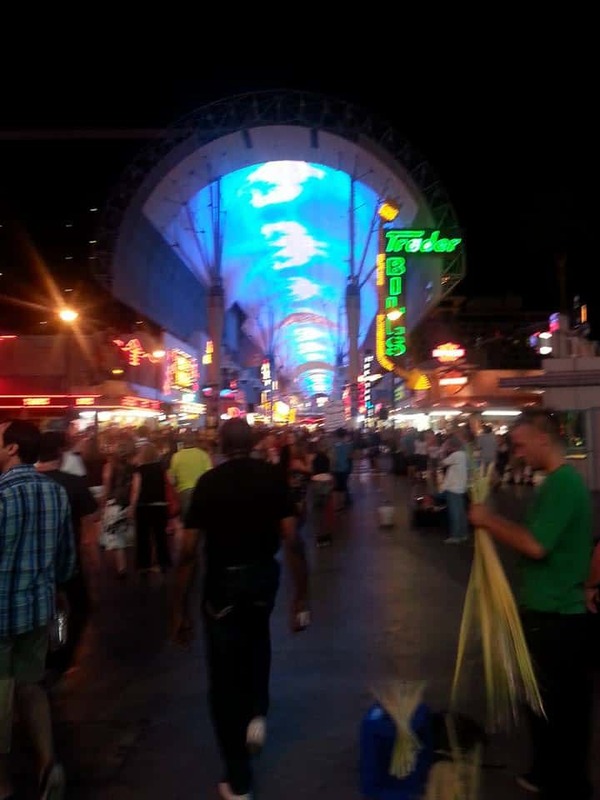 If you’re exploring during the day, like I did, rest assured that Fremont Street comes alive at night. The Strip makes it a bit more obvious that you are, indeed, in Las Vegas. Everything is huge and shiny. You can her music coming out of every restaurant and store. I ended up only experiencing a small fraction of what The Strip has to offer. While we were arriving in our cab, I noticed pedestrians walking around with all kinds of drinks in their hands. You can walk up to an outdoor booze slushie bar and chose from a variety of flavors TO GO! Am I dead? Is this heaven? Since Fremont Street was like being at a private party where everyone is your best friend, there was no point that I didn’t feel safe. Before heading out for our last night on Fremont Street, we were sitting in our hotel room ordering bottles of vodka to the room (as you do) and we turned on the TV. “The fatal shooting that took place on Fremont Street last night…” began the reporter. We had no idea! We were on a balcony bar at the time it happened. If someone had gotten shot on the street in my home town, every phone in the province would be ringing to find out who the boy “belonged to”. We didn’t even notice a commotion. Although the Strip is bigger, brighter, and busier, I felt safe there too! There were, however, more situations that made me more alert. My friends and I ended up at a bar one night for the simple reason that it had a pool. In hindsight, that’s pretty gross. Our new friends in the hot tub turned out to be gangsters and prostitutes and we naively took way too long figuring that out. As if asking a prostitute what she did for a living wasn’t weird enough, I also apologized to a man for not wanting to buy any cocaine from him and wished him good luck. That’s not to say that we were bombarded by danger and drugs at every corner. If you want to keep clean and stay safe, it’s certainly easy to do so. Taking into account the fatal shooting, gangsters, and cocaine (how is this sentence even being formed by me), I think Fremont Street wins this one for me. The bar scene on The Strip wasn’t my scene. I appreciate the lengths they go to in ensuring your safety, and for those who really want to go clubbing it’s a small price to pay. Club security was more intense than the airport and excuse me if going through a body scanner and watching my purse get rummaged through is a bit of a buzz kill. The bars on Fremont street were like stepping inside of your own drug induced dream and getting to pick which quirky and wonderful door to open first. Beauty Bar is a salon complete with hair dryer chairs from the 50’s. You can get an eyebrow/lip wax combo by day and nickel beers at night while enjoying live music on the large deck out back. Insert Coins was my favorite bar. It was filled with arcade games, huge flat screen TV’s and tons of video games. Sadly, Insert Coins closed down a few months after we left due to the increase of competition bars on Fremont street these days. I hear they plan on opening again so keep an eye out for this bar next time you’re on Fremont! We had a blast there and I definitely won all the games. On top of the variety of great bars to go to on Fremont Street there’s also the street itself. It’s also totally acceptable and ridiculously fun to skip the bars and just walk up and down the street. There are street performers, casinos, a zip line right above the street, and the Viva Vision light show. The light show is on a 1,500-foot screen above the street. That’s the size of 5 football fields and the largest projection screen in the world! Yes, we were the weird ones who laid down on the street to watch. No, I do not regret anything. 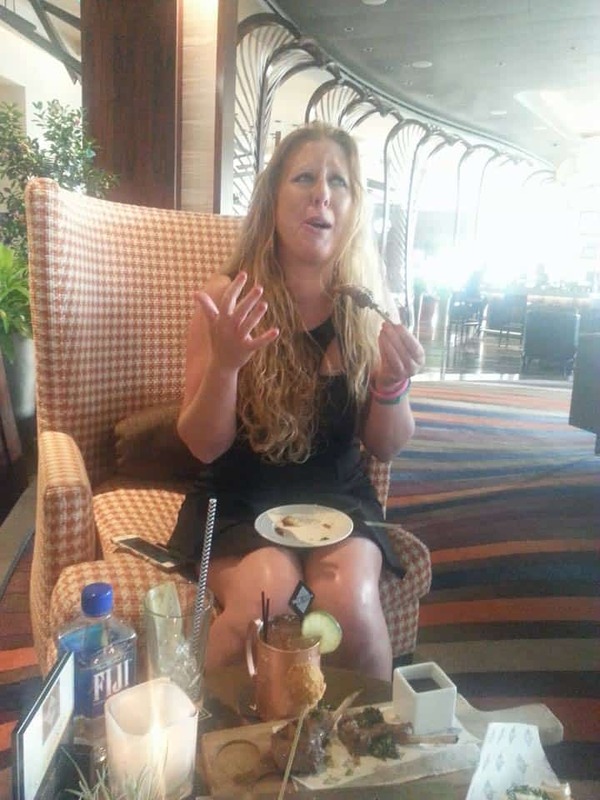 Let me start by saying that Vegas was the most mouth watering, taste bud tantalizing, soul reviving culinary experiences of my life and I could sob for a decade about the meals I ate. Candice (who cried over the lamb pops) describes our delight well. 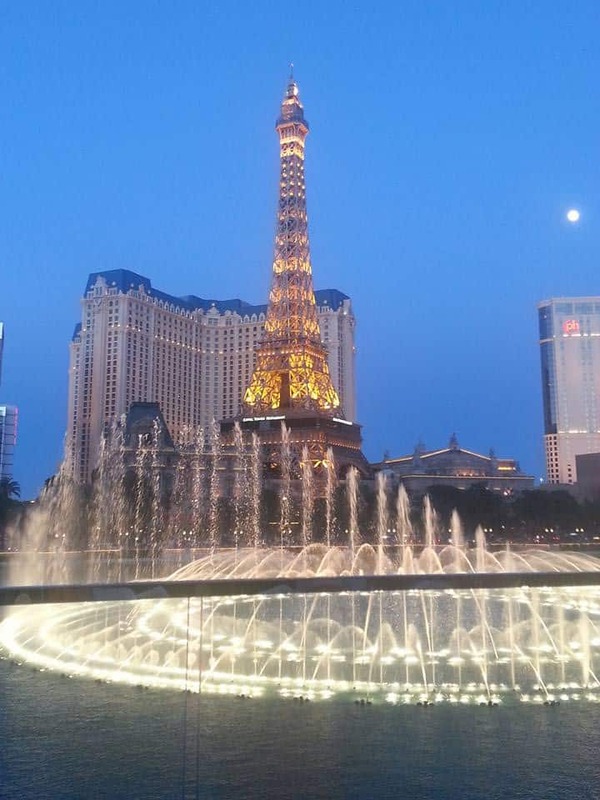 I had great meals on both streets but since The Strip included Margaretville and Hard Rock Café (which were more about experience and not food), and Bardot Brasserie and Lago at Bellagio (the thought of which makes me jittery in joyful memory) then The Strip takes the cake. Mmm. Cake. The Downtown Grand was the first Hotel we stayed in which is located a skip and a jump away from Fremont Street. The location to the street was perfect and the bar across the street had a happy hour worth celebrating. The best part of this hotel was the pool area. Reserved cabana, pool, bar, repeat, repeat, repeat again. The Mob Museum is a short walk from the hotel as well. THE MOB MUSEUM! Neat. For our nights closer to The Strip we stayed at The Vdara Hotel and Spa and to this day, when I think of that hotel, I can easily convince myself that I am a celebrity. If you want to forget your real life, hop up onto a high horse, and be treated like the royalty you imagine you are, go to Vdara. The staff in both hotels, every restaurant, and every bar were fantastic. I’m sorry that I ever held my head high assuming that I was friendly by default as a Canadian. I was blown away by the customer service and overall pleasantness of everyone I met. Hands down, The Strip wins this one. 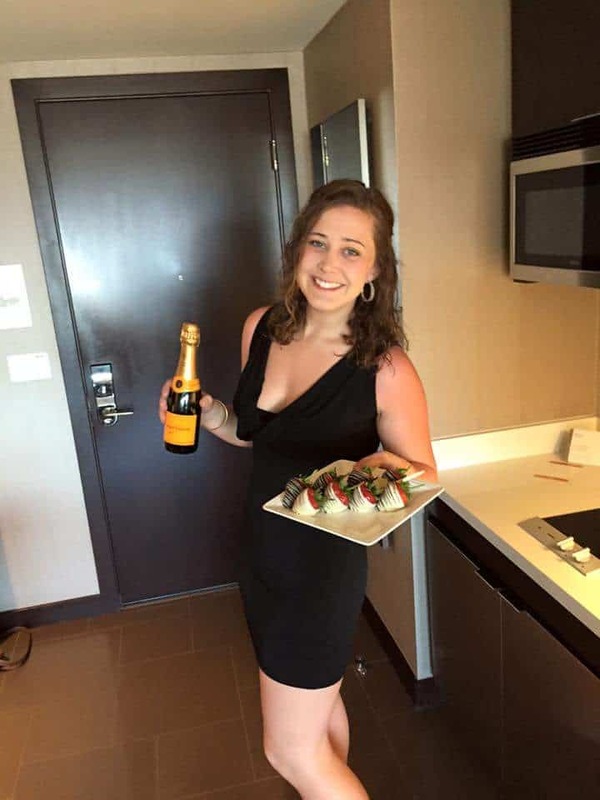 From the adorable southern accents of the handsome bell boys at the hotel, to the world changing massage that I could never afford, to the culinary delights, and right down to feeding sharks at Mandalay Bay Resort and Casino, and then walking outside to see the Eiffel Tower and the Sphinx. The Strip is just as gloriously overwhelming as you imagine it is. Personally, Fremont street is where I would choose to spend my nights after filling my days with sightseeing and stuffing my face on The Strip. Splitting your time up evenly between the two is definitely the best way to do Las Vegas. Trish is a freelance travel and lifestyle writer from the East Coast of Canada. Travel lover. Humor finder. Story teller.